On 17th June at the invitation of local Rotary Clubs of Amwell, Hertford, Hertford Shires and Ware, led by Hoddesdon, ten local schools brought 109 pupils in 28 teams to Broxbourne Civic Hall. 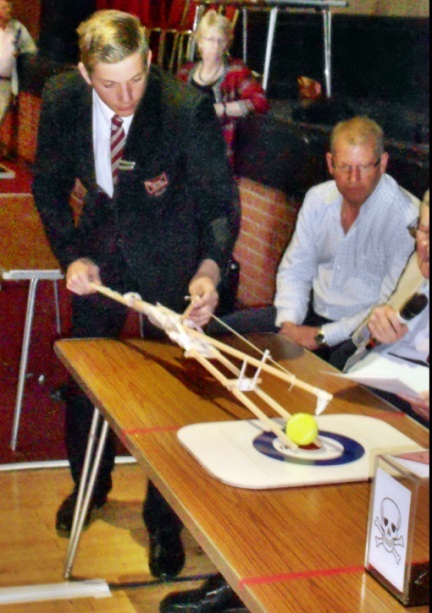 The aim was to tackle a Technical Challenge set only on the day. The Task this year was to plan, design and build a gripping device to safely handle a radioactive meteorite (tennis ball!) from a distance. There were three categories of team, with progressively more difficult manoeuvres to accomplish to Rotary judges satisfaction. Everybody had to spend the first 45 minutes on plans and design options (teamwork)then use their skills, technical lessons from school and a large measure of imagination and ingenuity to build models that were then demonstrated under timed conditions and broadcast to the whole hall on a large screen over the stage. Prizes were awarded by Mayors of Broxbourne (Cllr Bren Perryman), Hertford (Cllr Chantal Geall) and Ware (Cllr Rosalie Standley) and EHDC Chair Cllr Roger Beeching. MP Charles Walker looked in as he always does. 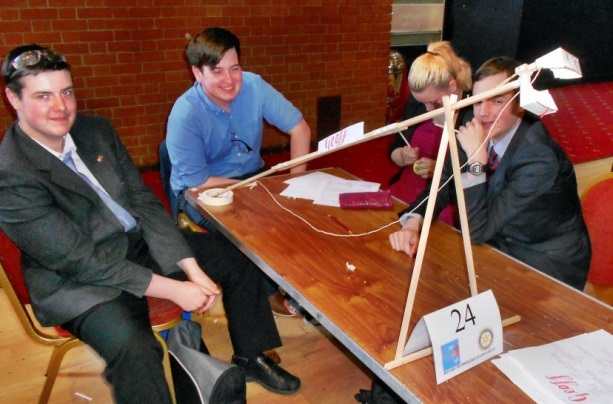 This was the 20th annual Technology Tournament in Hoddesdon, part of a national competition involving 4000 students. From the Rotary viewpoint, it ticks boxes for youth development, local community support and possibly new Rotary members for the future? The feedback from teachers, pupils, VIP guests and visiting Rotarians from Wootton Bassett and Dulwich was particularly good this year. Organisers are indebted to sponsors, shown below, many of whom have supported the Tournament for a number of years, to Lobster Pot for a mouth-watering lunch and to the Civic Hall for excellent facilities. The young people who took part in 2014 had a challenging but fun day out, directly linked to their school curriculum, with the possibility of earning Crest Awards on top. Rotary organisers were paddling like mad beneath the surface in preparation over several months but enjoyed the benefits of a well-oiled machine on the day. All went home tired but very happy.